People, money, and time are finite. There are always more things to do than there are people, money, and time to do them. Setting priorities is a balancing act. It should give you a list of tasks in the order in which they should be attempted. Setting priorities will help you manage the expectations of all of your stakeholders – your staff, your managers, and your customers. Resources for more important tasks are scheduled before resources for less important tasks are scheduled. Is the situation trending worse or better? When does this task need to be completed? How much effort is required to complete it? Therefore, when does work need to start? What are the worst things that could happen if this task is not completed? What are the best things that could happen if this task is completed? Who is the customer for this task? If you are unsure, talking to your trusted colleagues is a great option. 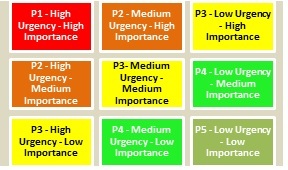 You may wish to visualise the priority setting process by plotting your tasks on a Cartesian Grid, with increasing importance on the y-axis and increasing urgency on the x-axis (see graphic example below). You can put as many levels of importance and urgency as you like into the grid – but the more you put in, the more complex the priority setting process becomes. So you may wish to start simply. Setting priorities will please some people and disappoint others – so don’t expect to keep everybody happy all the time. If you’e having trouble with priorities, when you’re ready to talk, we’re ready to listen – so contact the Hub!